Kusadasi was the one non-tendering port we did not book Mik a port adventure. The reason was there was not a private vehicle with lift option and the only accessible option was a group bus tour. The group bus tour would not have been too bad, but it was about $400 a person. Thus, it would have cost almost as much for him and mom as the private vehicle tours they did, although actually more than the non-lift ones in Turkey. Also, he hates buses in general and it lacked the flexibility you get on your own, so we thought it better to not waste money on it. In the end though, it might have been cheaper to send them on that then let them get off just to shop in Kusadasi. I encouraged Mik and Mom to get off and just walk around the port a little before Dad and I left on our port adventure, as the dock was right next to the city and Mik wanted to at least say he really had been in Turkey. Well, they did get off, but they did not get far. They only went to the shops on the dock and they did not even get far in there. They ended up buying some leather jackets and a vest before they decided they must return to the ship before they did any more damage. 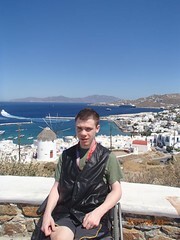 At least Mik has already gotten some wear out of his vest (photo is him in Mykonos) and we did not do the port adventure for them because I have a feeling they would have still gotten the leather.